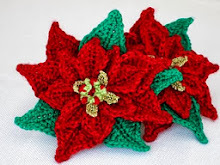 My Crochet , Mis Tejidos by Luna: Santa's Hat and more earwarmers . Santa's Hat and more earwarmers . Happy Thanksgivin's Day for all who will be celebrating it,I do.